LIU Brookville will get $12M to help open veterinary school. Cold Spring Harbor lab and Northwell Health each to receive $30M. Three medical facilities proposed for Long Island will receive $72 million from New York State and create at least 260 jobs, Gov. Andrew M. Cuomo announced Friday night. The money will help Long Island University open the only veterinary medicine college in the metropolitan area and one of a handful across the country. Cuomo said the LIU veterinary school in Brookville, together with projects on the campuses of Cold Spring Harbor Laboratory in Cold Spring Harbor and Northwell Health in Manhasset, will help boost the region’s biotechnology industry. Biotech, also called life sciences, has been identified by economic developers and economists as the sector offering the most potential for creating jobs with high salaries. Biotech employs about 12,300 people, with annual salaries, on average, of $55,218, according to a recent Long Island Index research report. Cuomo said Cold Spring Harbor Laboratory and Northwell’s Feinstein Institute for Medical Research will each receive $30 million in state funding and LIU will receive $12 million. Cuomo said the three institutions receiving $72 million in state funding, together with Brookhaven National Laboratory and Stony Brook University, form a “research corridor” similar to North Carolina’s Research Triangle and California’s Silicon Valley. Lab inventions must be turned into commercial products that lead to new jobs locally, he said. 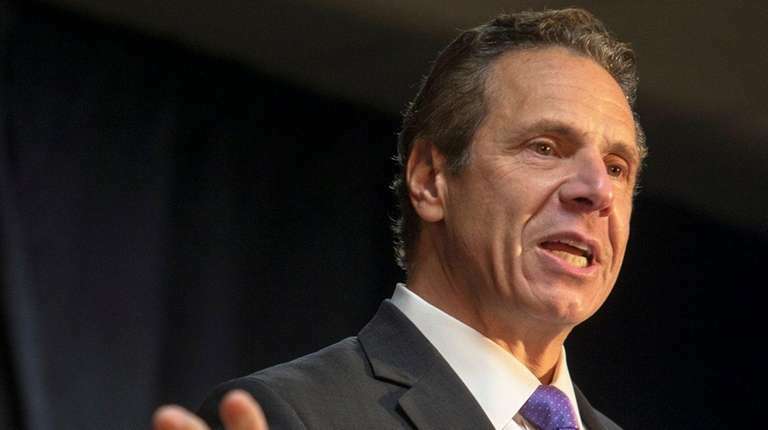 “And I believe that’s the future and that’s what is going to be generating more and more jobs,” Cuomo said. LIU’s College of Veterinary Medicine will join 30 others in the country. The $40 million school will begin classes next year and expects to enroll 100 students each year in a four-year doctoral program. The university expects to hire at least 100 people for the school and has established collaborations with more than 20 institutions including the Bronx Zoo and North Shore Animal League. LIU president Kimberly Cline said the state funding was critical to the school’s success. Cold Spring Harbor Laboratory plans to develop a three-building neuroscience research complex focused on cognition, including mapping the wiring diagram of the human brain. Stillman said Cold Spring Harbor lab will match the state’s $30 million with federal and private funds. The project will create 55 jobs at the lab and 50 across Long Island. Northwell’s Feinstein Institute is establishing a bioelectronic medicine center in Manhasset. The project initially had been planned for the Nassau Hub in Uniondale and received $50 million in state support toward a total cost of $350 million. However, Northwell decided last year that the Hub was too far from Feinstein’s main campus. Cuomo’s announcement on Friday clears up uncertainty about whether state government will continue to back the research center. The bioelectronic medicine center has attracted financial support from public companies such as industrial conglomerate General Electric Co. and biotech giant United Therapeutics Corp., according to state officials. The center also is working with Cold Spring Harbor lab and Hofstra University. Northwell, based in New Hyde Park, is the state’s largest private-sector employer. The bioelectronic medicine center will add 56 scientists to its payroll of 40 workers. The funding unveiled by Cuomo is part of $500 million secured by Long Island’s nine state senators in the 2015-16 state budget for “transformative projects.” The senators argued at the time that Nassau and Suffolk counties didn’t receive enough of a $5.4 billion state surplus from national banking settlements. Separately, Cuomo called on Long Island’s business leaders to support a repeal of the federal provision that caps at $10,000 the amount of state and local taxes that New Yorkers can deduct on their federal income tax returns, beginning with the 2018 tax year. The provision was included in the federal tax overhaul in December 2017. Cuomo said the cap on SALT deductions will cause residents to leave New York State and reduce home values.